Weight: 1.6 oz. (45.28 g.), if each truffle is .4 oz. Today was Day #6 of Chocolate and Mediterranean Theme Week. Goats are hardy animals, able to live in warm, dry climates... such as Greece, France, and many other Mediterranean countries. And so we have feta cheese, chevre, and other variants of goat cheese. And, then you have the Surfing Goat Dairy in Hawaii; the company (with the motto "Da Feta Mo' Betta") produces dozens of different types of specialty goat cheeses (such as the goat cheese wrapped in grape leaves, dolma style, shown here) and also a variety of soft goat cheeses (a few are shown here: O Sole Mio, Garden Fantasia, and Ivory Coast on gluten-free toast squares). 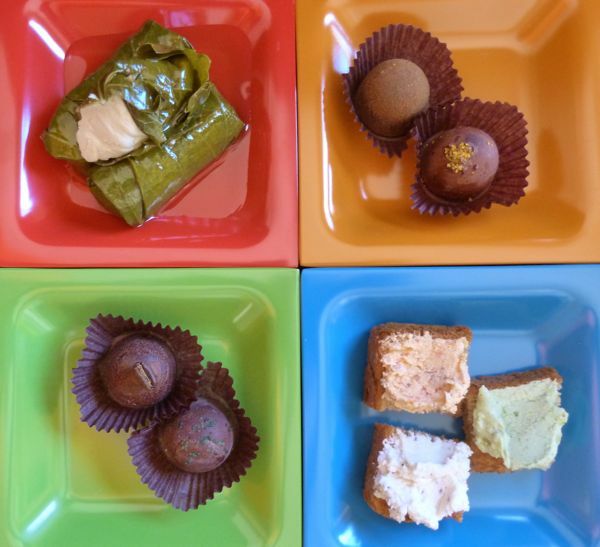 Oh, and did I mention, the Surfing Goat Dairy also makes chocolate truffles? They were good. I tried to pick flavors that might be seen in the Mediterranean. Coffee originally came from Ethiopia, but travelled to Egypt, Turkey and the rest of the Mediterranean countries over the years, as did limes (from Southeast Asia), and spices (such as cinnamon). 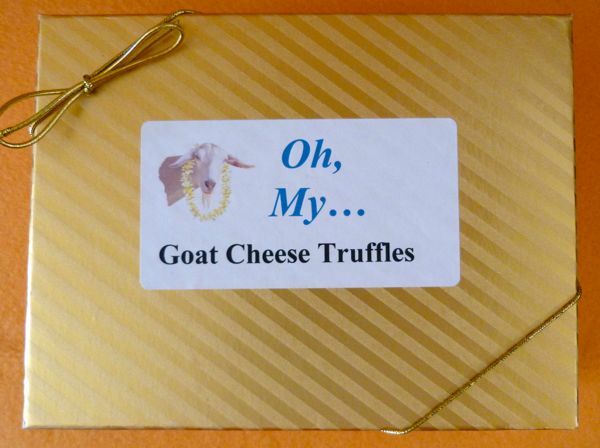 I couldn't really taste any goat cheese in this batch of truffles, but, those who are super tasters might be able to catch a faint hint of this flavor. The Surfing Goat Dairy is located in Kula (Maui) in Hawaii.